This past week, Gartner published its Magic Quadrant for Strategic Sourcing Application Suites. Over the years, I have learned that my readers love Magic Quadrants, so you can download the report itself here (courtesy of one of the “winners”, BravoSolutions). More interesting than the strategic sourcing magic quadrant itself, are the lessons we can learn from the evolution of this market over 20+ years. It’s easy to forget strategic sourcing applications were among the first truly multi-tenant cloud applications to gain mass adoption in the enterprise. Sure, Salesforce is now the King, but CRM was slightly behind strategic sourcing in the large enterprise. Lesson #1: Creating value is not the same as capturing it. FreeMarkets invented the market and sold for $500 million in stock and cash. Ariba sold to SAP for $4.5 billion, but remember to get into sourcing, Ariba bought FreeMarkets, Procuri, Trading Dynamics, and SupplierMarket for billions in stock and cash. And Ariba’s e-procurement and network businesses may have represented the bulk of the valuation. Emptoris and Frictionless sold for miniscule amounts, as did many other stand-alone strategic sourcing applications. 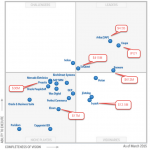 Look at the leaders in the Magic Quadrant today. They are all fine companies, but none will be on the IPO calendar any time soon! The bottom line is that strategic sourcing applications are simply not that hard to build, they are not that well integrated into enterprises, and they are not the stickiest of applications. Strategic sourcing applications were initially largely separate from e-procurement applications. Companies that produced and sold one, did not generally compete in the other market. As mentioned above, Ariba largely bought its way into the e-sourcing market. Over time, many of the stand-alone strategic sourcing applications were bought by e-procurement vendors and vice versa. 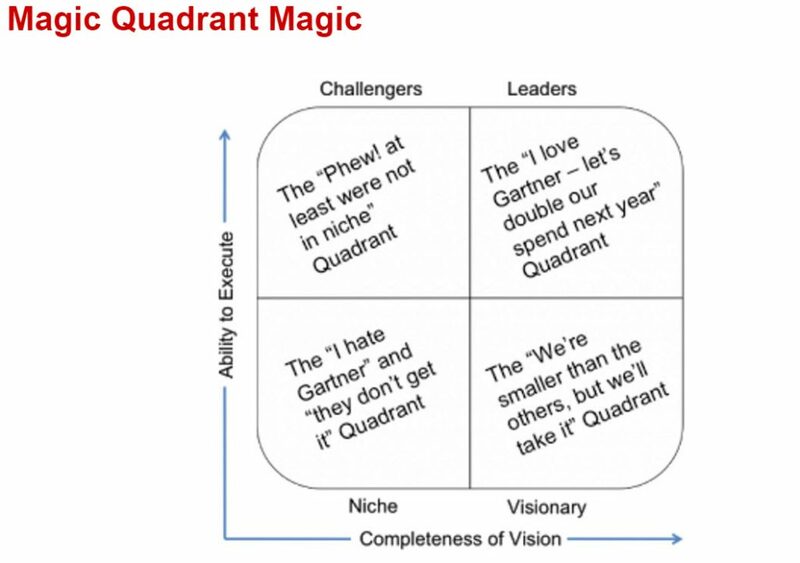 Take a look at the Magic Quadrant again. Each “leader” now also has an e-procurement application–either built internally or acquired. In fact, 9 or 10 of the 14 strategic sourcing application suite vendors in the Magic Quadrant offer their product as part of a larger spend management suite. This makes the “pure plays”, SynerTrade, Pool4Tool, and ScanMarket, worth watching. The term “strategic sourcing” was created as part of a consulting business by AT Kearney. It’s probably still a great consulting business. But surely the share or, at least the growth, of that market has been eaten by software. FreeMarkets, for instance, started as a tech-enabled managed service and evolved rapidly into a software business with a much smaller managed service business (eventually sold to Accenture). Lesson #4: Platform Thinking was too late. Almost everyone who built a strategic sourcing application, built a portal for enterprise buyers to invite their suppliers. Each portal was a little one-to-many “cul-de-sac”. A buyer could only see their supply base, no one else’s. A buyer could only use their own RFP templates and supplier ratings. The thinking went that buyers would never share their supply bases or intellectual property with other buyers. This thinking contains a lot of truth, but it overlooked all sorts of counter examples such as non-strategic spot buys, consortium buying, the willingness of some industry buyers to share information for the good of the industry as a whole (e.g., fraud or safety), and the willingness of buyers to share information with non-competitors. Ariba has tried to join its network thinking with its sourcing product (e.g., Ariba Dsicovery and Spot Buy) and perhaps others will as well. But the lack of platform thinking in strategic sourcing left open many opportunities for GPOs, AmazonBusiness, vertical industry aggregators and credentialers to build attractive businesses. Many of you readers also watched the strategic sourcing industry evolve. What other lessons have I missed? 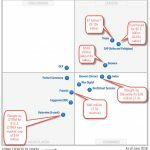 Gartner's Procure-to-Pay Suite Magic Quadrant shows why there will be so much interest in a Coupa IPO when it comes. The 2016 Gartner Magic Quadrant for Procure-to-Pay Suites is available. What's most interesting is who no longer meets the criteria for inclusion. Matchmaking is one of nine value propositions enterprise software platform providers can offer their participants. 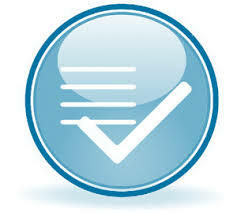 Credentialers are one of the nine value propositions enterprise software platforms can offer their participants.